Put love on the menu this Valentine’s Day with a delicious home-cooked meal. Whether you want to surprise your loved one with a romantic night in or rustle up a storm in the kitchen together, our decadent three course meal will make it a night to remember. 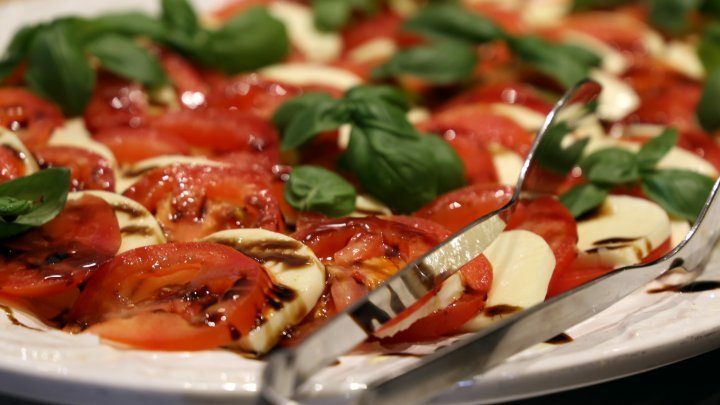 Arrange the tomato slices on a plate and season with salt, pepper and olive oil. Add the raspberries and top with a drizzle of raspberry vinegar, scattering with basil to serve. Season the beef with black pepper. Heat the oil in a large frying pan, add the beef, and cook over a high heat until browned all over. 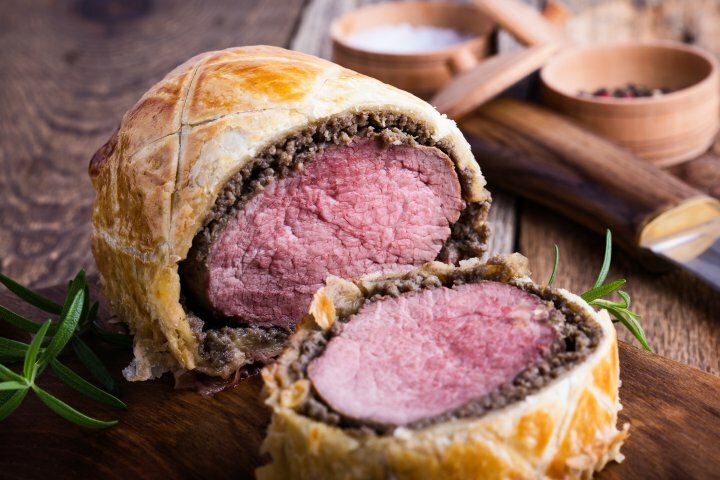 Put the beef fillet in a roasting tin and cook in a pre-heated oven at 220°C for 25 minutes for rare beef, 35 minutes for medium, or 40 minutes for well-done. Leave to cool completely. Meanwhile, melt the butter in the frying pan, add the onion and mushrooms, and cook, stirring for 3 minutes until softened. Increase the heat to high and cook until the excess moisture has evaporated. Turn into a bowl and leave to cool completely. Add liver pâté to the mushrooms and onion mixture, season with salt and pepper, and stir well to combine. Wrap the beef and pâté mixture in the pastry (see method below). Roll out 300g (10 oz) of the pastry to a 30 x 40 cm rectangle. Spread half of the pâté mixture down the middle, leaving a 10cm border on each side. Remove the string from the beef and place the beef on the pâté mixture. Cover with the remaining pâté mixture. Brush the pastry border with beaten egg, fold the short sides of the pastry over the beef. Bake at 200°C for 45 minutes or until the pastry is crisp and golden. Cover with foil after 30 minutes to prevent the pastry becoming too brown. Leave to stand for about 10 minutes, then slice and serve with the gravy. Heat the oven to gas 220°C. 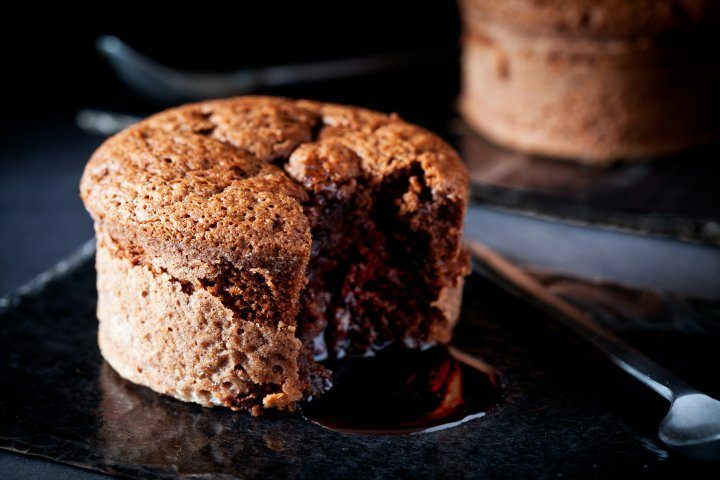 Grease 4 x 200ml ramekins or small oven-proof dishes. Break up the dark chocolate and place with the butter in a heat-proof glass bowl over a pan of simmering water until melted. Remove from the heat and set aside to cool slightly. In a clean, grease-free bowl, whisk the egg whites until they form stiff peaks. Gradually whisk in the caster sugar. Mix the yolks into the melted chocolate and add to egg whites, folding in gently. Then spoon the mixture into the ramekins. Bake for 14 minutes until they feel firm in the centre. Make the sauce by grating the orange rind into fine shreds. Squeeze 125ml orange juice. Place the rind, half the juice and sugar in a pan and boil for 2-3 mins. Stir the cornflour into the remaining juice and bring to the boil. Crush the cardamom pods, removing the husks and add to the pan, or use ground cardamom. When ready, remove the ramekins from the oven and serve hot, cracking the top of each one and pouring over the sauce.